Legendary boxer Mike Tyson personally hand-signed this 'Punch Out' 16x20 Photo. Mike Tyson commonly called 'Iron Mike' was one of the most feared and fearsome men to ever step into a boxing ring. Tyson was a tough kid who grew up on even tougher streets and legendary trainer Cus D'Amato helped him harness his energy on the way to becoming the youngest boxer ever to win a heavyweight title. 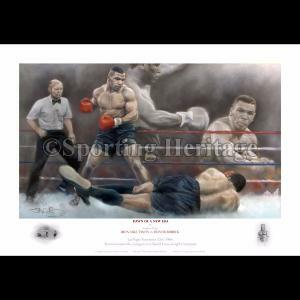 Over the years Tyson amassed a 50-6-2 professional record and defeated the likes of Trevor Berbick, James 'Bonecrusher' Smith, Tyrell Biggs, Larry Holmes, and Michael Spinks. Mike Tyson has hand This Mike Tyson Autograph is guaranteed authentic and includes a Steiner Sports Certificate of Authenticity and accompanying tamper-evident Steiner Hologram.